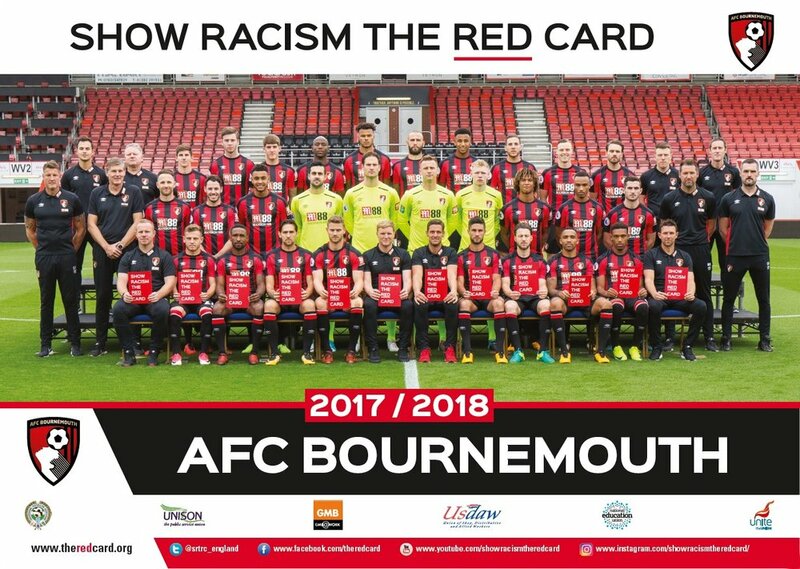 On Tuesday 13th March 2018, Show Racism the Red Card (SRtRC) held an educational event at the Vitality Stadium, the home of AFC Bournemouth. The campaign worked in partnership with AFC Bournemouth & AFC Bournemouth Community Sports Trust to educate local young people about the dangers of racism. 90 young people from local primary schools attended the event which saw the Year 5/6’s take part in an educational workshop, watch the SRtRC educational film and then take part in a ‘Press Conference’ with a panel of special guests. Young people from a local primary schools arrived at the Vitality stadium in the afternoon and headed to the room where they would spend the remainder of the afternoon. After a quick introduction to the afternoon the young people went into an educational workshop which was conducted by Education Worker, Shona, from SRtRC. The workshop made young people explore stereotypes, define racism, and think critically about the way in which we stereotype. The young people engaged in thoughtful and honest conversation with their peers about the dangers of stereotyping. Tottenham Ladies players and SRtRC Education Worker, Shona, sat on the panel. Joining Shona was Steve Cuss, Steve is the head of the Community department at AFC Bournemouth. Faith Nhemachena from AFC Bournemouth Ladies took the time out of her day to sit on the panel and answer questions from the young people. Former Professional Footballer, Jimmy Glass, also sat on the panel to help answer questions. And lastly joining the panel was AFC Bournemouth 1st team player, Junior Stanislas, who rounded off a fantastic panel. Young people from each school put forward a variety of questions to the panel regarding racism. In your opinion do you think out of every good there is a bad? Have you ever experienced racism and how did it make you feel? Who is your inspiration when it comes to racism? If someone was racist to you on the pitch how would you confront them? These were just a few examples of the questions that the panel were taking it in turn to answer. The panel explained to the young people what they should do if they experience racism and who they can report it to. The panel also provided brilliant advice on what each person can do to tackle racism. Prizes were given out to the three best questions asked to the panel. AFC Bournemouth kindly donated three footballs that were given out as prizes. Show Racism the Red Card would like to thank everyone at AFC Bournemouth for their support in organising the event and a special thank you to Ben Abberstien and Steve Cuss who made the event possible. The power of role-models to educate young people should never be underestimated, therefore, a massive thank you to Shona, Jimmy, Steve, Faith and Junior. A big thank you to the Professional Footballers Association who continue to support the work of Show Racism the Red Card and make events like this possible. And finally, Show Racism the Red Card would like to thank all the young people for their honest engagement from start to finish.